Like any vehicle, your Everett Mercedes requires regular routine maintenance and service to remain in peak operating condition. Many folks thing about oil as the primary fluid to monitor and change on a regular basis. While the oil is changed most frequently, there are a number of other fluids crucial to the operation of your car. Engine oil lubricates the engine in addition to acting as a coolant. The oil also cleans the engine’s internal components and provides a seal for the engine. If the oil in your car is black, it’s definitely time for a change! New oil is usually a golden color. To check the oil level in your car, park on a level surface. With the engine turned off, raise the hood of your car and locate the dipstick that measures the oil level. The dipstick is generally located on the side of the engine on rear wheel drive vehicles and along the front on front wheel drive cars. Remove the dipstick, wipe it clean with a shop rag and replace the dipstick, tightening completely. Pull the dipstick back out and read the level. If the level is less than one quart low, do not add oil. Wait until the level is at least one quart low to avoid overfilling the oil. When there is too much oil in your engine, it can cause a number of problems. When the crankcase is overfilled, the oil will become frothy from the action within the crankcase. Because the oil is aerated, it cannot properly lubricate the engine. Left unresolved, your engine will suffer the same catastrophic failure as a no- or low-oil situation. Additional problems can occur with too much oil. The seals and gaskets can leak from the increased pressure from the excess oil. Leaking oil can lead to catalytic convertor failure as it plugs with the oil. The excess oil can also foul the O2 sensor. If you suspect an overfill of oil in your engine, take your vehicle to Everett Mercedes Service & Repair immediately to resolve the problem. The likely solution, if caught in time will be similar to an oil change. 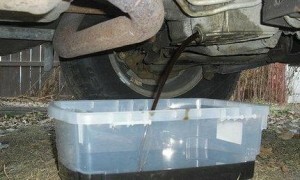 The technician will hoist your Mercedes and remove the oil plug, draining excess oil. It may be advised to have a complete oil change, replacing both oil and air filters to be certain neither are plugged from the excess oil. If, when you check you oil, the level is less than one quart low, pay close attention to the level until it reaches one quart low. Refill with exactly one quart. Monitoring the oil level and condition is key to efficient operation of your car’s engine.